Do you have questions about our S-5 racking, or questions about solar in general? Give us a call at 1-800-472-1142. 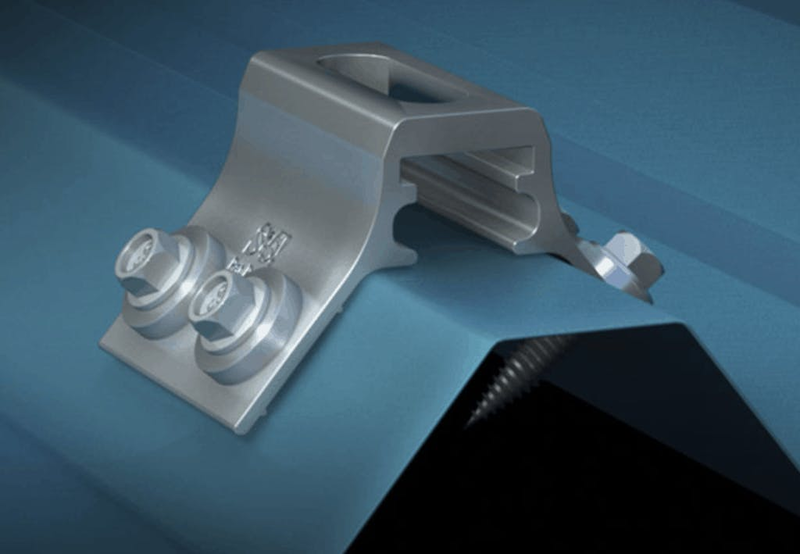 RibBracket™ can be used to mount almost anything onto the most common exposed-fastened, trapezoidal roof profiles marketed in North America today. No messy sealants to apply! No chance for leaks! The RibBracket comes with a factory-applied EPDM rubber gasket seal already on the base, and the S-5!® patented reservoir conceals the EPDM from UV exposure, preventing drying and cracks. Installation is simple! The RibBracket is mounted directly onto the crown of the panel, straddling the profile. No surface preparation is necessary; simply wipe away excess oil and debris, align, and apply. Secure through the pre-punched holes using the appropriate fasteners or Bulb-tite rivets for the supporting roof material. The slotted top hole, which accommodates standard M8 nuts and bolts, simplifies alignment and maximizes flexibility in attaching ancillaries. A structural aluminum attachment bracket, RibBracket is compatible with most common metal roofing materials and many North American trapezoidal profiles. For design assistance, ask your distributor, or view the independent lab test data that can be used for load-critical designs and applications. S-5! holding strength is unmatched in the industry. Mounting screws sold separately, 4 screws per bracket. S-5! stays on top of trends in the metal industry to provide the right products to fit virtually any metal roof profile They have developed clamps and brackets to support solar and utility installations, along with a top-of-the-line snow retention system, also known as snow guard systems, to support and protect your metal roof investment. S-5! supports continued research, development, and testing to assure quality end-products for metal roofs. They also provide their expertise in the metal construction industry, educating clients to preserve safety and security when attaching almost anything to a metal roof. Always manufactured in the U.S.A., they oversee every aspect of production for unequaled quality assurance at the best price.